Other Filipinos think that when they heard Kilawin food, they think it’s a raw fish cooked in vinegar (deboned fish soaked in vinegar). 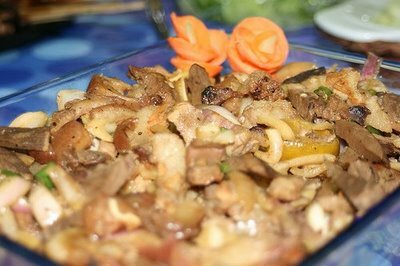 Kilawin is a Kapampangan recipe again that has pork and liver cooked in vinegar. Ingredients and cooking procedure after the jump. 1. Soak pork and liver separately in a mixture of vinegar, salt, pepper and onions. 2. Saute’ garlic in shortening until brown. Add pork mixture, pressing the pieces very well. 3. Cover and simmer until pork is tender. 4. Add liver mixture and water, boil and allow minxture to thicken. 5. You can also add chopped green chilli if you want it a bit hot. This entry was posted in Pork Recipes on January 6, 2014 by Kram.